The recipe card and video is at the bottom of the post, but don’t be too hasty! The post contains all the tips and tricks. A while go we attended a birthday celebration at a Japanese Hibachi Steakhouse. It was my first time at one and I completely fell in love with a simple clear onion broth we were served as a starter. The name is Japanese Clear Onion soup! I couldn’t believe how tasty that little bowl of brown broth was (haha)! As with everything we eat, if we love it, we immediately know that we will eventually do our own recreation of it. This was no different. After some research, planning, cooking and taste-testing, we finally perfected our very own Japanese Clear Onion Soup recipe. What are clear onion soup ingredients? 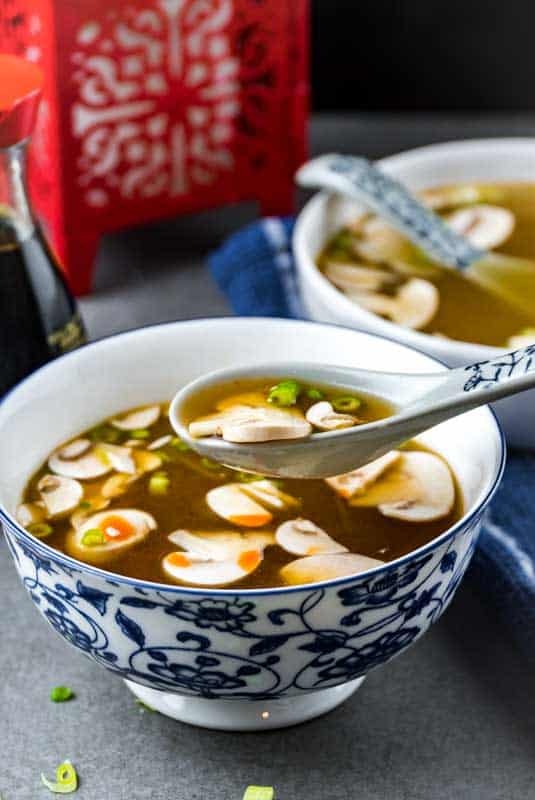 With just 6 simple and easy vegetable ingredients, this is the perfect quick and easy vegetarian appetizer soup for your traditional Japanese (or Chinese) themed dinner party or if you’re just doing some fun homemade Benihana for the family. If you’re like me, you’ll make it just because you love soup (and because this one is incredibly light and easy…and DELICIOUS). So what ingredients goes into a Japanese Onion Soup recipe? It is a very simple vegetable clear soup. So, it isn’t very substantial, but that’s exactly what makes it perfect as a starter. Or as a light meal with very low calories – perfect for weight loss. 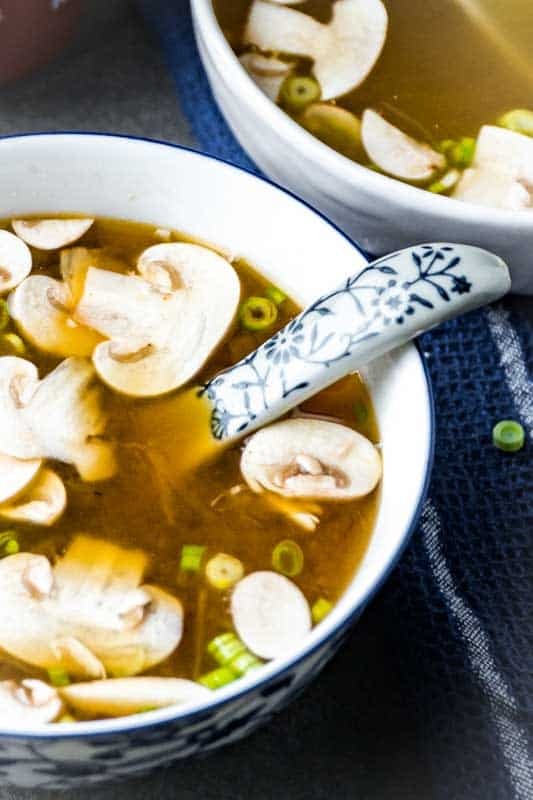 So, now that you know what you need, now you need to know how to make this great clear broth mushroom soup. How to make Japanese Clear Onion Soup for an Appetizer? The best thing about this recipe, is that there’s hardly any hands on time, as with the majority of Living Chirpy recipes. What I’m trying to say is that you have no excuse to not impress your dinner guests with this cute little soup. Even something as simple as “Clear Onion Soup” can seem special if you serve it as an appetizer in a pretty little bowl and an authentic little spoon. So, you start by frying the onions in a little bit of oil (preferably sesame oil for extra flavor) until they start to caramelize brown. Add the rest of the ingredients and let it simmer away for 30 minutes. Garnish it with thinly sliced mushrooms and chopped scallions. Japanese Clear Onion Soup is ready to be served. So, if you’re sold on making this as an appetizer! 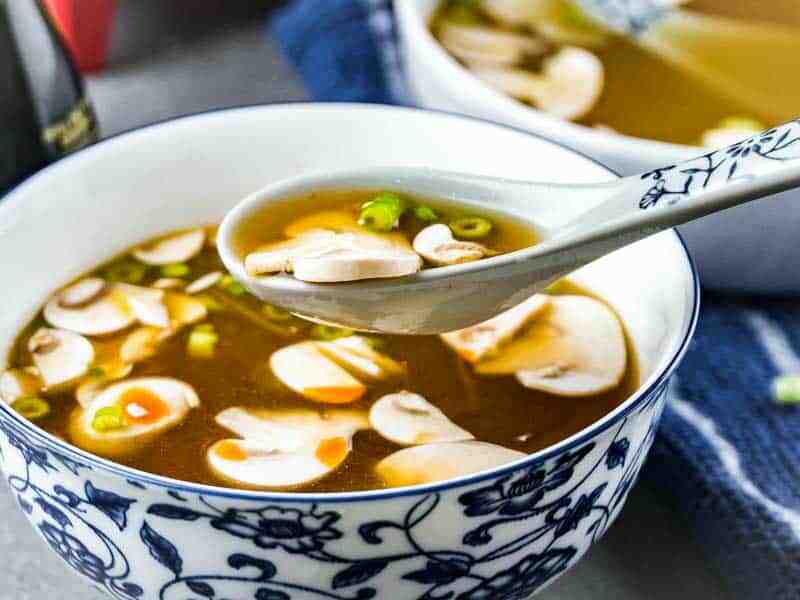 Why not check out some of our other healthy Asian-inspired recipes to serve up as a main dish! 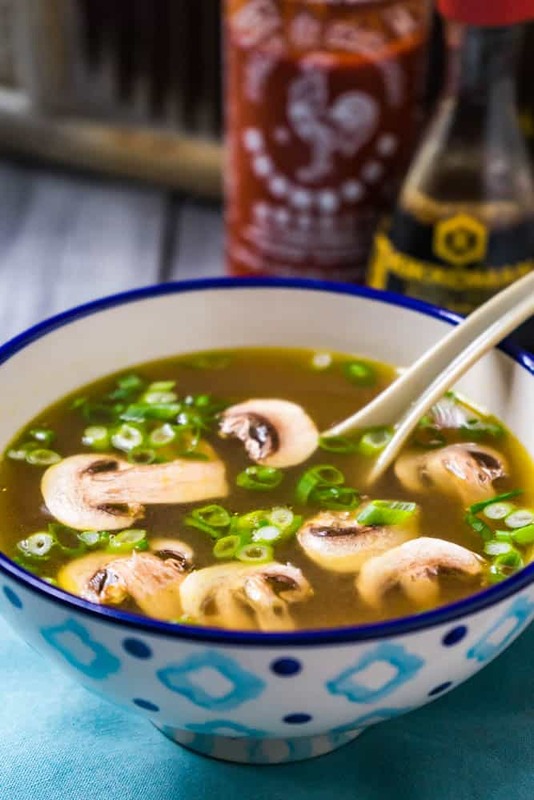 For a fully compliant soup, use Coconut Aminos instead of Soy Sauce. I have made tons of recipes for this soup. This one takes the CAKE!! When it gets cold I love to make soups each week to have with dinner. This soup will go into our rotation! I was wondering where the vitamin D comes from? Other than that…, This recipe is awesome ! Also for people wondering what to do with the veggies, I left them in the soup for fiber content. 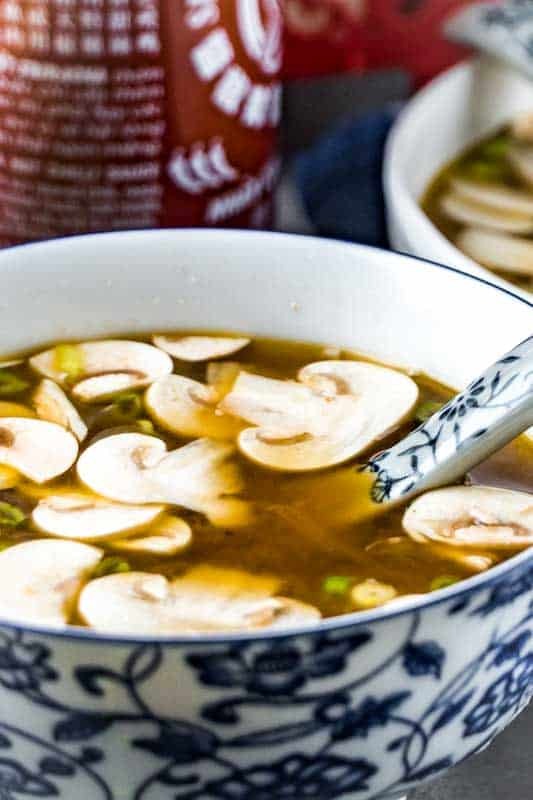 The vitamin D comes from the mushrooms. The caveat is that the mushrooms have to be exposed to ultraviolet light prior to harvest to increase the Vitamin D level. There’s no way of knowing if the grower went to the trouble to expose the mushrooms to sunlight or ultraviolet growing lights. How many carbs are in this? 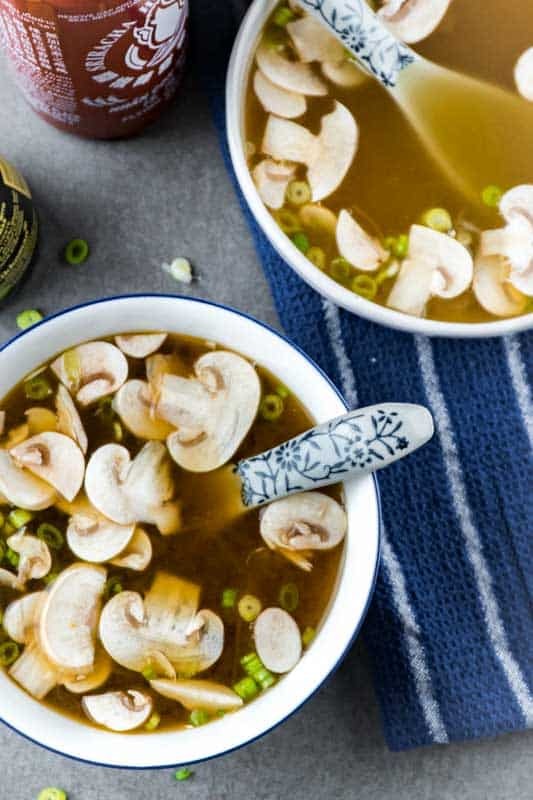 Is this truly a Keto friendly soup? I’m new to all this Keto stuff. Thanks. Love this soup. I added some red pepper flakes and left the veggies in the broth for extra flavor. This was amazing to try! I had always wanted to make Japanese food and this is what got me started! It was so simple and easy! I’ve had it several ways, I’ve even left the veggies in it and added chicken to it! It made a great chicken veggie soup! Why does everyone in the US and Europe think SOY SAUCE is bad for you? It’s the perfect fermented item to season food with, hell of a lot better than salt. Hi! 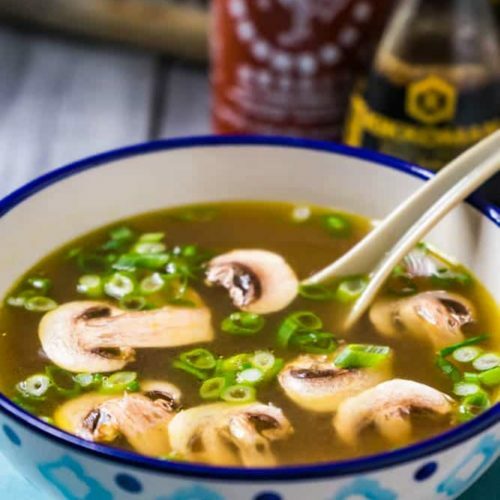 It’s not that we (and I’m talking about us running the blog) think soy sauce is “bad” for you, but since we are a healthy low-carb blog and soy sauce is made from a legume (which is high carb and inflammatory). We recommend Coconut Aminos to people that are on a strict low carb diet.